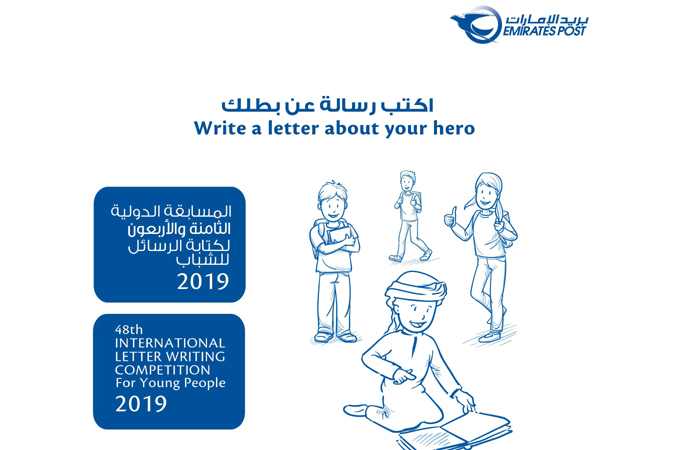 Emirates Post, the leading postal and express delivery provider in the region, is encouraging schoolchildren to rediscover the art of letter writing by entering the UPU International Letter Writing Competition. Now in its 48th year, the prestigious competition is organised by Emirates Post as part of the global activity of the Universal Postal Union (UPU), a United Nations body that oversees the world’s post. Since 1971, the UPU has invited young writers aged between 10 and 15 years to write letters on a given theme to be in with a chance of winning exciting prizes. “Write a letter to your hero” is the inspirational theme of the 2019 competition, which is being rolled out across schools around the world. Ten letters will be selected in the UAE and the winners will receive their prizes on World Post Day (October 9). One overall winner will also be chosen to represent the UAE at the international round of the competition.